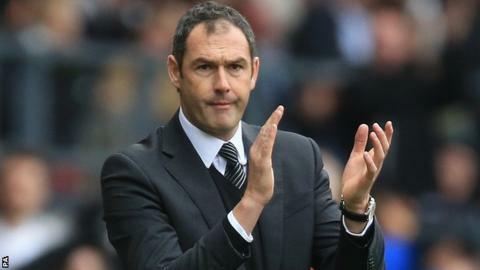 Derby County chairman Mel Morris believes head coach Paul Clement has the chance to build a lasting dynasty in the manner of Sir Alex Ferguson at Manchester United. Ferguson retired in 2013 after 26 years as manager of the Old Trafford club. When asked if Clement could become their Ferguson, Morris told BBC Radio Derby's Sportscene Talk-In: "I actually think he could. "Paul has an opportunity to help shape how we run this club." Clement joined the Rams in the summer after working under Carlo Ancelotti at Real Madrid, and after failing to win any of their first six games of the season, the 43-year-old has guided the Rams to third in the Championship table. They have won seven and drawn two of their last nine games and could go top of the table if they beat QPR at the iPro Stadium on Tuesday. Morris hopes Clement's impressive start is the beginning of a lengthy spell in charge that can bring a stability and infrastructure which will last for many years. He added: "If you look at what we are trying to build at Derby, I think Alex Ferguson defined the culture and the philosophy at Manchester United because he had that long-term tenure. "I am not sure of the background and how much of that came from the club, but he became the way the club operated. "In a similar way, here Paul has an opportunity to help shape how we run this club and I would like that, providing he has a strong enough hand in doing that with us, that he will help build something he would want to stay with. "And at the age Paul is at, then why not?"